The is the obligatory first phase that must precede all variant discovery. 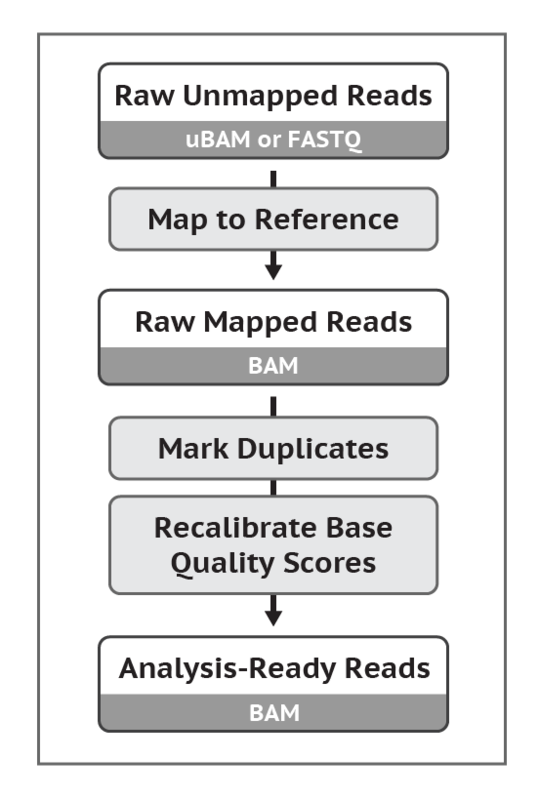 It involves pre-processing the raw sequence data (provided in FASTQ or uBAM format) to produce analysis-ready BAM files. This involves alignment to a reference genome as well as some data cleanup operations to correct for technical biases and make the data suitable for analysis. This workflow is designed to operate on individual samples, for which the data is initially organized in distinct subsets called readgroups. These correspond to the intersection of libraries (the DNA product extracted from biological samples and prepared for sequencing, which includes fragmenting and tagging with identifying barcodes) and lanes (units of physical separation on the DNA sequencing chips) generated through multiplexing (the process of mixing multiple libraries and sequencing them on multiple lanes, for risk and artifact mitigation purposes). Our reference implementations expect the read data to be input in unmapped BAM (uBAM) format. Conversion utilities are available to convert from FASTQ to uBAM. We begin by mapping the sequence reads to the reference genome to produce a file in SAM/BAM format sorted by coordinate. Next, we mark duplicates to mitigate biases introduced by data generation steps such as PCR amplification. Finally, we recalibrate the base quality scores, because the variant calling algorithms rely heavily on the quality scores assigned to the individual base calls in each sequence read. This first processing step is performed per-read group and consists of mapping each individual read pair to the reference genome, which is a synthetic single-stranded representation of common genome sequence that is intended to provide a common coordinate framework for all genomic analysis. Because the mapping algorithm processes each read pair in isolation, this can be massively parallelized to increase throughput as desired. This second processing step is performed per-sample and consists of identifying read pairs that are likely to have originated from duplicates of the same original DNA fragments through some artifactual processes. These are considered to be non-independent observations, so the program tags all but of the read pairs within each set of duplicates, causing them to be ignored by default during the variant discovery process. This step constitutes a major bottleneck since it involves making a large number of comparisons between all the read pairs belonging to the sample, across all of its readgroups. It is followed by a sorting operation (not explicitly shown in the workflow diagram) that also constitutes a performance bottleneck, since it also operates across all reads belonging to the sample. Both algorithms continue to be the target of optimization efforts to reduce their impact on latency. This third processing step is performed per-sample and consists of applying machine learning to detect and correct for patterns of systematic errors in the base quality scores, which are confidence scores emitted by the sequencer for each base. Base quality scores play an important role in weighing the evidence for or against possible variant alleles during the variant discovery process, so it's important to correct any systematic bias observed in the data. Biases can originate from biochemical processes during library preparation and sequencing, from manufacturing defects in the chips, or instrumentation defects in the sequencer. 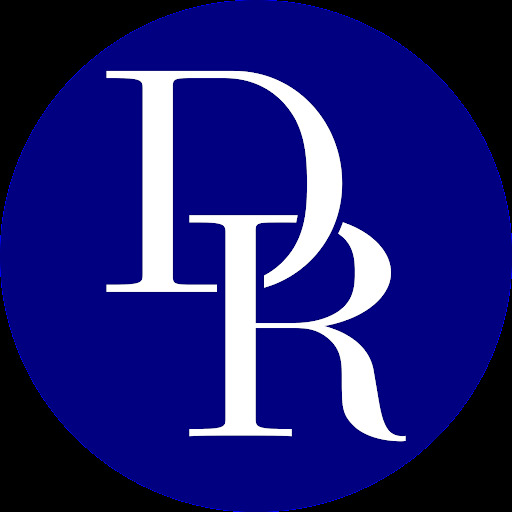 The recalibration procedure involves collecting covariate statistics from all base calls in the dataset, building a model from those statistics, and applying base quality adjustments to the dataset based on the resulting model. The initial statistics collection can be parallelized by scattering across genomic coordinates, typically by chromosome or batches of chromosomes but this can be broken down further to boost throughput if needed. Then the per-region statistics must be gathered into a single genome-wide model of covariation; this cannot be parallelized but it is computationally trivial, and therefore not a bottleneck. Finally, the recalibration rules derived from the model are applied to the original dataset to produce a recalibrated dataset. This is parallelized in the same way as the initial statistics collection, over genomic regions, then followed by a final file merge operation to produce a single analysis-ready file per sample. Is it ok to sort and index the raw aligned BAM that is later merged with the uBAM, or should I align the raw BAM only, merge with uBAM, then only sort & index the final merged BAM? Also, when will tutorials for each of these steps be updated for GATK4? I think this article will help. Most of the theory behind the tools are the same in GATK4, but I see what you are saying about commands needing to be updated. I will make a note and see if we can update them asap. Hi dear Sheila, I am a little confused, so did the json file and wdl file in this github page already been upgraded https://github.com/gatk-workflows/gatk4-data-processing for hg38 or not? [2018-08-14 10:28:58,02] [error] WorkflowManagerActor Workflow c83e2d4f-03e8-48a7-9571-629c1b15651a failed (during ExecutingWorkflowState): Job PreProcessingForVariantDiscovery_GATK4.SamToFastqAndBwaMem:16:1 exited with return code 127 which has not been declared as a valid return code. See 'continueOnReturnCode' runtime attribute for more details. Check the content of stderr for potential additional information: /Users/shuanglu/cromwell-executions/PreProcessingForVariantDiscovery_GATK4/c83e2d4f-03e8-48a7-9571-629c1b15651a/call-SamToFastqAndBwaMem/shard-16/execution/stderr. I used docker run -i -t broadinstitute/genomes-in-the-cloud:2.3.1-1512499786 and ls , found there is a picard file in this path. I feel lost. Someone will help you here. I have a question about the sample data: NA12878_24RG_small. What is the Small unaligned bam list of NA12878 (NA12878_24RG_small.txt)? In these best practice workflows, GATK team usually offer NA12878_24RG_small or NA12878 sample data to test. I cannot find out what is the NA12878_24RG_small data, what is the difference between it and normal NA12878? What is the word ´24RG´ implied here? Thanks for your reading and looking forward to your answer. Looking at the workflow on github it looks like one input.json file is required for each sample that I want to preprocess. So should I create one json file for each of them and launch each analysis separately? I know that I can write a new wdl workflow that imports the PreProcessingForVariantDiscovery worflow and scatter among many samples but I was wondering if there's another way. # to avoid having to spend time just merging BAM files. Generally, in this wdl script, you call markduplicate then sort. but in this paper, sort step was supposed to do firstly. I found a little bit funny result: my input 4 ubams, each of them sized 33G, I checked cromwell-execution folder, my aligned.duplicates-marked.sorted.bam sized around 120G. After, BQSR, the final output bam file sized around 70 G. then I run the haplotypecaller wdl script, offered by github page as well, got a really tiny size g.vcf file, 2.7G NA12878.hg38.g.vcf.gz. I used exactly the same wdl file I offered above, in json file, just changed input as my own 4 bam files passing as a ubam list, and keep using the ref and known sites resource file offered in above json file. And certainly, I adjust all files path to its absolute path in my virtual machine. Do you think this is normal or I did something wrong?